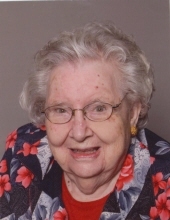 Our mom, Opal Elaine (Craven) Murphy, was born on September 6, 1920, in Mulhall, Oklahoma. She was part of the “Greatest Generation” and with her sweet, infectious smile was the best mom ever. In her generous, caring way, she was always there for us. On March 30, 2019, at the age of 98, she went to be with our Lord. What a life! After mom graduated from Mulhall High School in 1938, she attended Central State Teachers College, earning her degree in elementary education in 1942. On August 15, 1942, she married the love of her life, James “Jim” Murphy in Santa Monica, California. In 1952, mom and dad moved to Midwest City and became lifelong members of Wickline Methodist Church, where they especially enjoyed participating in NOAH. Mom was preceded in death by her parents, Joseph William “Bill”, Jr. and Stella Rose Craven, her husband Jim, her brothers Diehl and Glenn Craven, and sister Vera Hazen. She is survived by her sons James “Craig” Murphy of Midwest City, OK; Brent Murphy and his wife Connie of Broken Arrow, OK; two granddaughters, Bryanna Ross and her husband Jon of Guthrie, OK; Meghan Murphy of New Orleans, LA; three great grandchildren, Connor, Gabriel, and Ainsley; and numerous nieces and nephews. The family is especially grateful for mom’s caregivers, including Helen Smith, Vlasha Harvey, and Samantha Cox, along with many friends at Fountain Brook. A funeral service will be held to celebrate mom’s wonderful life at 10:00 am, April 3, 2019, at Wickline Methodist Church with interment to follow at Arlington Memory Gardens Cemetery. Donations may be made in her honor to Wickline Methodist Church or Oklahoma Medical Research Foundation. To send flowers or a remembrance gift to the family of Opal Murphy, please visit our Tribute Store. "Email Address" would like to share the life celebration of Opal Murphy. Click on the "link" to go to share a favorite memory or leave a condolence message for the family.